Tip: If you don’t have a HEX Editor installed on your PC you can find various free versions to download from the internet. Open your example files next to one another in the HEX Editor so that you can compare them better. Compare the displayed HEX Codes from the three files and look out for identical codes. These codes can then be used as a signature. 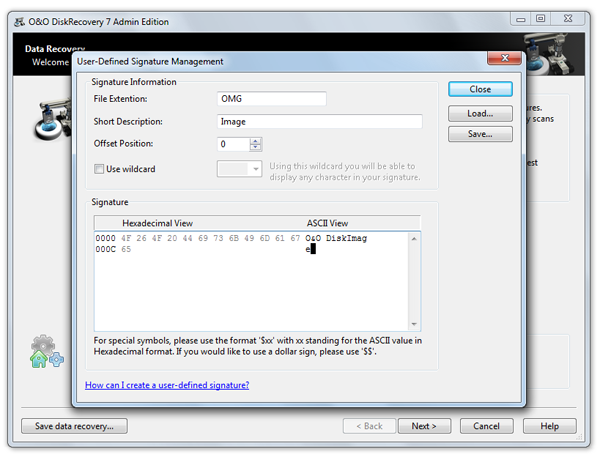 Now open parallel to the HEX Editor our file recovery software O&O DiskRecovery and select on the start page the option “Create user defined signatures”. Assign an appropriate file ending for the file signature you wish to create and enter it in the field “File Extension”. Now enter the selected string of characters which was identical with your three example files into the Signature window. In our experience the best length is between ten and fifteen pairs of characters. Once you have entered the signature click on “Save“. So that the file signature is automatically recognized, save it direct to the installation folder in O&O DiskRecovery. It will then be automatically taken into account in every future file recovery run.